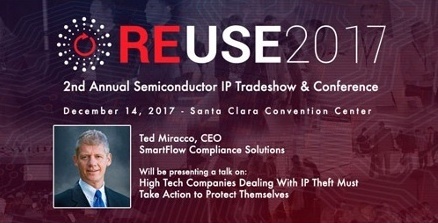 Miracco’s keynote, titled, “A Brief History of Intellectual Property Theft” will discuss how semiconductor companies throughout the world need to look at ways to protect their designs from unauthorized use and outright piracy, and how to make sure they are benefitting from their innovations on a fair playing field. For more information and to register to attend REUSE 2017, visit reuse2017.com. SmartFlow Compliance Solutions was created to help software vendors combat piracy and under compliance with automated tools that minimize the resources needed to identify software abuse and to generate revenue recovery & sales. Over a decade in development, the company’s innovative SmartFlow identification and analysis software represents the best practices of license compliance programs within the world’s leading companies, providing clients with insight on how incompliance and piracy are affecting their business, customers and profits.